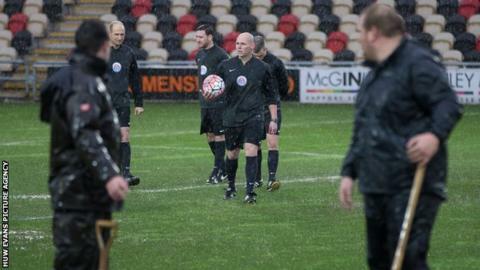 Newport County manager John Sheridan criticised the club's ground staff after their FA Cup third-round tie against Blackburn was postponed due to a waterlogged pitch at Rodney Parade. "I think we should've done better to try and get the game on," he said. Mark Jones, head of operations at Rodney Parade, was "disappointed" by Sheridan's comments. "The pitch was in a playable condition... It then started raining heavily at 12:45," said Jones. Newport had been confident earlier in the week that the match would go ahead but referee Charles Breakspear called it off after heavy rain on Saturday. League Two side County and Newport RFC had games postponed last weekend due to a waterlogged pitch at the same ground. The FA Cup fixture could be rearranged for the week starting Monday, 18 January. "I feel as though we should've prepared a little bit more for the weather," Sheridan told BBC Radio Wales. "We knew it was a massive game for us and it was important we got the game on. "It's not me who's going to be chatting with him [Jones] but I feel as though we should've done our best to get the game on, and I don't think we did."